Got milk? No, not the kind you think. In an unusual twist, some men are turning to human milk in a quest to bulk up or improve their health, believing all the benefits it provides to infants can produce similar effects in adults. The trend is puzzling experts who say breast milk is meant for human babies, not human grown-ups. They worry about the safety of drinking milk from donors who are not properly screened. Still, some men think the nutrient-rich liquid is the secret to their success at the gym. “It gives me incredible energy I don’t get from other food and drinks,” Anthony, who didn’t disclose his last name, recently told New York Magazine. Many bodybuilders also tout the benefits of breast milk, with some of them calling it “the greatest supplement ever” on the message boards of BodyBuilding.com. It’s not exactly a product you can pick up at the store, so when men are seeking breast milk, some are turning to sites such as OnlyTheBreast.com, which connect lactating women who want to sell or donate their milk with buyers — usually other moms, but not always. OnlyTheBreast.com has had a “Men Buying Breast Milk” category since its inception more than four years ago, said founder Glenn Snow, adding it's not surprising there’s demand for breast milk among men. “We think breast milk is amazing and can be used for many health and wellness purposes regardless of the age or gender of the person seeking its benefits,” Snow told TODAY.com. Still, only a small fraction of the site’s members seek milk for their own health and wellness, Snow said, with most focused on helping mothers share milk with babies in need. Breast milk is rich in nutrients and antibodies, according to the U.S. Department of Health and Human Services. It contains just the right amount of fat, sugar, water, and protein to help a baby grow and it’s easier to digest. Because of all those benefits, the American Academy of Pediatrics recommends breast-feeding for the first six months of a baby's life. But there is no evidence that breast milk has a protective role in the health of adults, said Elisa Zied, a registered dietitian nutritionist in New York. 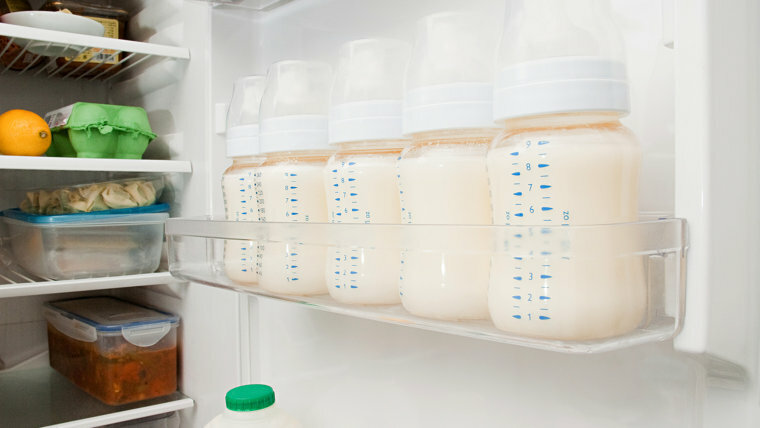 Breast milk contains immunoglobulins that help fight infection—but they are immunoglobulins that, for the most part, adults have and infants don’t, said Dr. Claire McCarthy, a pediatrician and medical communications editor at Boston Children’s Hospital. She noted that human milk was meant for humans while cow’s milk was meant for cows, so by that reasoning, human milk would be healthier for people to drink than cow’s milk. But at the same time, it’s also meant for human babies, not adults, McCarthy added. Both Zied and McCarthy were concerned about the risk of disease when drinking breast milk from an unknown source. “Milk is a bodily fluid and can carry infections that are present in the body, such as HIV, hepatitis and others,” McCarthy said. Human milk that’s obtained directly from individuals or through the Internet is not likely to come from a donor who was adequately screened for disease or contamination risk, the FDA warns. The agency recommends that parents who are seeking donor milk for their babies contact the Human Milk Banking Association of North America, which dispenses milk by prescription or by hospital purchase order only. The association has safety guidelines for screening donors, and collecting, processing, handling, testing and storing milk. Meanwhile, a study last fall found human milk bought and sold on the Internet may be contaminated. So Zied advised adults to stick with proven nutrition guidelines. “Why not play it safe and look to the foods and beverages available instead of playing Russian roulette with your health?” she said.